An interesting piece taken from Swiss Ramble regarding our CEO target Ivan Gazidis. 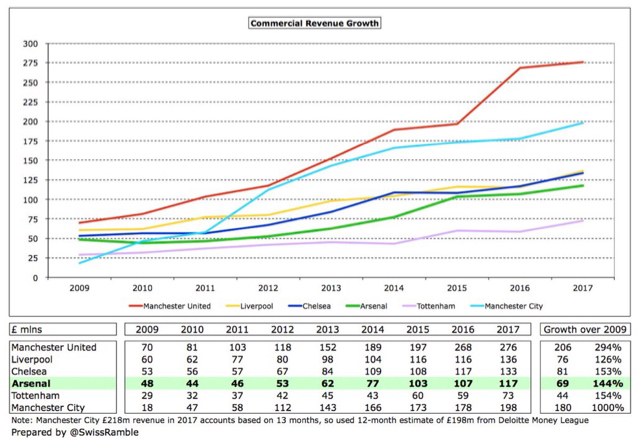 #AFC revenue has grown by an impressive £198m under Gazidis, only outpaced by #MCFC £366m & #MUFC £303m in absolute terms. However, this was the 2nd smallest % growth of Big 6. Furthermore, 2017/18 revenue is likely to be £40-50m lower, due to not qualifying for Champions League. Analysing #AFC £198m revenue growth under Gazidis, most (£125m) is from TV, due to central Premier League deals. As Warren Buffett said, “a rising tide lifts all boats”. Commercial up £69m, but this was a slam dunk after long-term sponsorships linked to stadium funding expired. #AFC commercial revenue, where you would expect Gazidis to have most influence, has grown by £69m, the second lowest of the Big 6 over this period, only ahead of #THFC £44m. 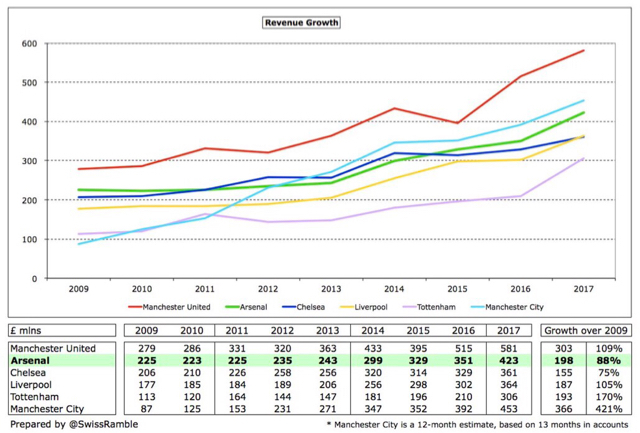 #AFC growth was around a third of #MUFC £209m and also behind #MCFC £180m, #CFC £81m and #LFC £76m. 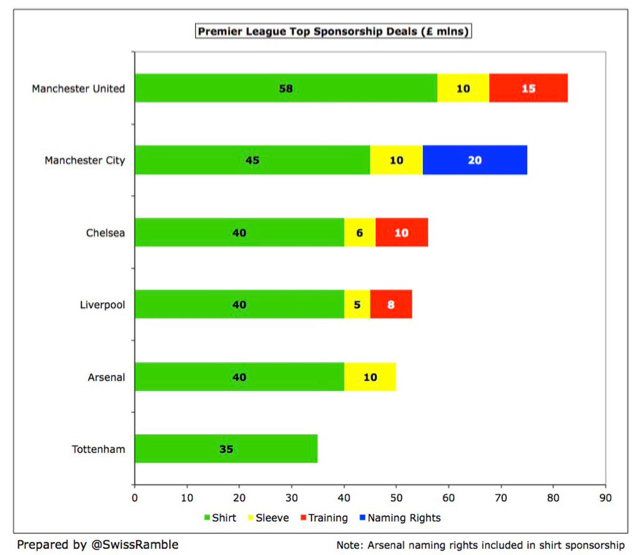 In fairness to Gazidis, Emirates extended their #AFC deal (shirt sponsorship & naming rights) from 18/19 for £40m a year (up £10m) – the same as #CFC & #LFC, but below #MUFC £58m (current exchange rates) & #MCFC £45m. Also added “visit Rwanda” as sleeve sponsor for £10m a year. In 2013 Gazidis said #AFC “should be able to compete at a level like a club such as Bayern Munich”. Since then, revenue gap fell from £127m to £82m in 2017, but this is still a large shortfall. With the anticipated £40-50m revenue reduction in 18/19, gap will be same as it was. 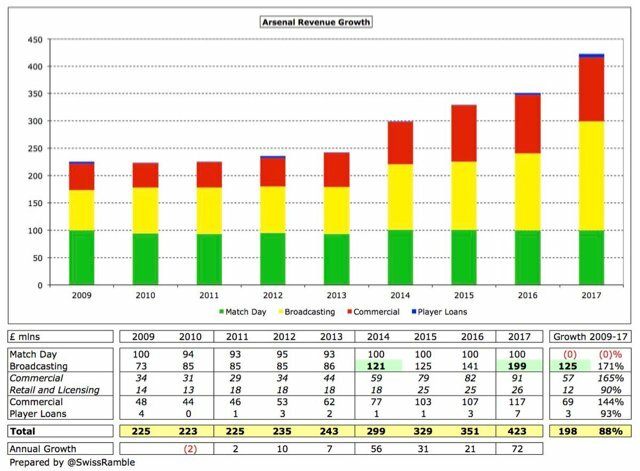 In 2011 Gazidis said that “we deliberately kept some powder dry” re #AFC spending plans, which has proved to be a poor strategy, as transfer fees have continued to significantly rise, while the weaker Pound has further reduced the club’s spending power. Furthermore, #AFC ability to outspend others has diminished. In 2012 they had almost as much cash (£154m) as the rest of the Premier League combined (£181m), but in 2017 other clubs have seen their cash boosted by new PL TV deals, so they now have £819m compared to #AFC £180m. 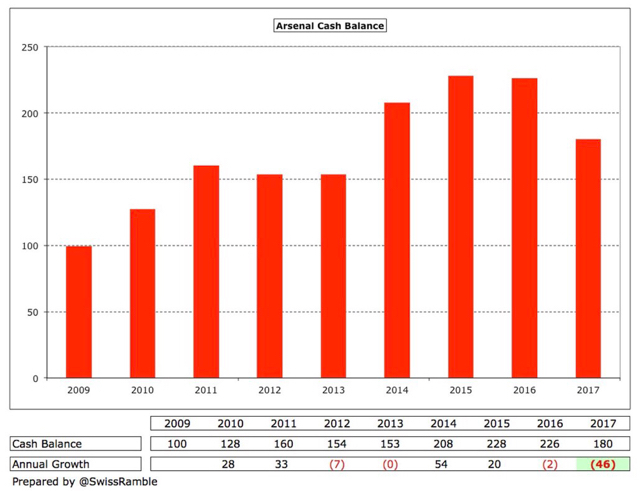 Indeed, after many years of rising cash, this has actually fallen at #AFC in last 2 years: £2m in 2016 & £46m in 2017. 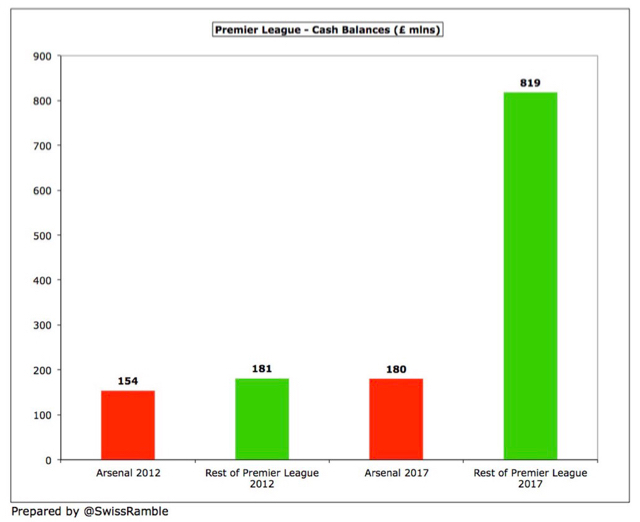 This is arguably no bad thing, as it is partly due to higher player purchases, but it does mean that Arsenal now have less cash than #MUFC £290m & #THFC £200m. Up to the end of the 2016/17 season Gazidis had received £18m remuneration from #AFC. Assuming a similar level in 2017/18 as the previous season, this means that he has trousered over £21m to date. His latest £2.6m remuneration represents a 31% increase over his first full year. 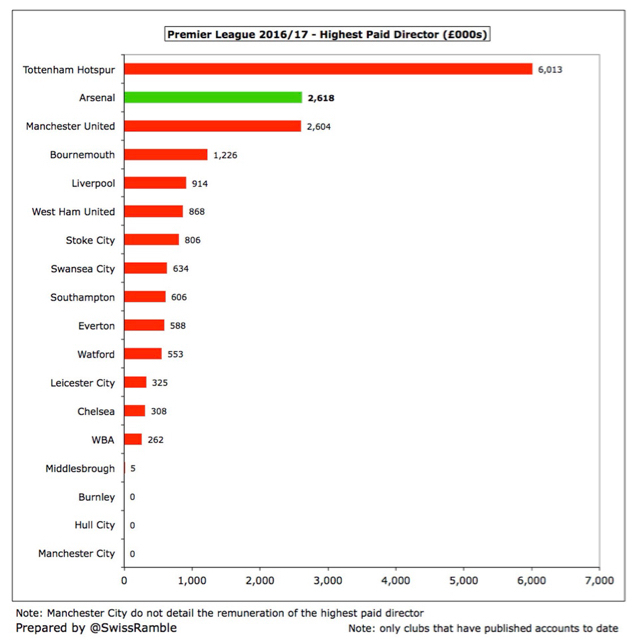 Despite a slight decrease in 2016/17 Gazidis’ #AFC remuneration of £2.6m is only below Daniel Levy’s extraordinary £6m at #THFC (though this apparently includes a backdated pay rise and bonuses), but just above Ed Woodward at #MUFC. Almost three times his #LFC equivalent £0.9m. 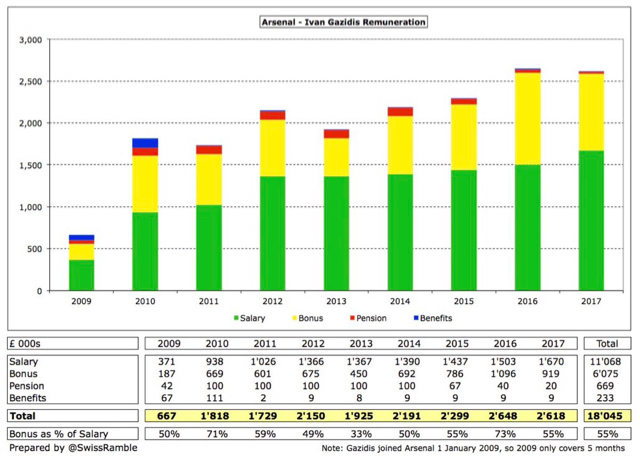 From a financial perspective Ivan Gazidis has not been a bad chief executive at #AFC, just not especially good. 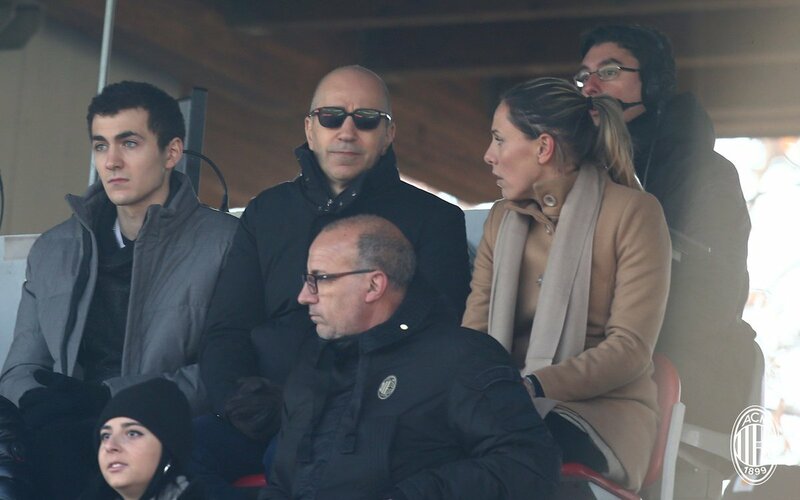 Whether his track record merits Milan’s eager pursuit is debatable. If he does leave Arsenal, the club should be able to find a replacement at least as capable. Interesting read. 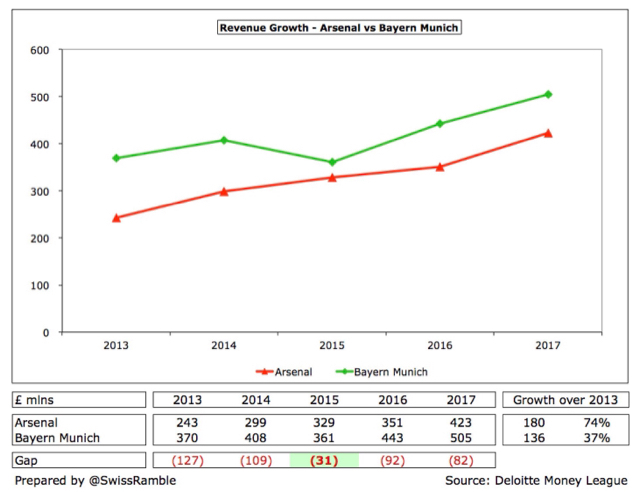 From that it seems that Arsenal's decline in revenue was in part due to lack of success on the field. I think that was somewhat related to Wenger's reluctance to spend. as soon as he left Arsenal they ditched Puma and signed a huge deal with Adidas. Officially our CEO from today. May he double our revenues in 2-3 years. "Among his first meetings will be sponsors Fly Emirates to renegotiate the contract, then present a new business plan to kit sponsors Puma. The club is also seeking an automobile sponsorship, as their deal with Audi expired two years ago." I'm expecting big things from him. Welcom Ivan, please bring us more money. I expect him to re-negotiate the deals with Puma, Fly Emirates and get us some new sponsors. I read somewhere that Milan had signed a deal with Samsung... but i don't know if that's genuine or not. Question - why do we always have bald CEOs?! So this guy's primarily mission here is to break even in 2,5 years, gonna be interesting to follow his work. Good luck. The potential revenues we can make over the next 2.5 years is much higher than what would be required to break even with our current cost structure. That won’t be Gazidis’ challenge. It’s going to come down to - with the extra money we make off the revenue streams that he unlocks, how many high level signings can we make and still break-even? In other words, as 2021 June approaches, our choices will be about the kind of spend we can do with our extra money that still allows us to break-even. If it isn’t a lot, we will still ensure a break-even but make lower cost purchases. Elliott will judge him based on whether those signings take us to the top of European football or not.